Glenavon manager Gary Hamilton has singled out the individual strength at the heart of Saturday’s Irish Cup success. Goals by James Gray and Greg Moorhouse sent Glenavon marching on into the quarter-finals courtesy of a 2-0 defeat of Armagh City. 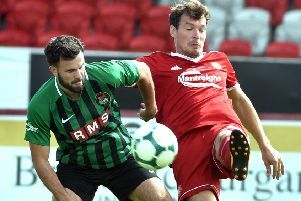 The reward is a derby date with Portadown at Shamrock Park next month and Hamilton was quick to highlight the personal performances within the team structure. “Momentum is important in football and that comes from individuals doing the right work to help the team overall on a consistent basis,” said Hamilton. “Going into the tie we were calling for the players to produce the professional performance required to see off Armagh. “It was a poor game of football to be honest and we took time to adjust to the synthetic pitch. “That had an impact but we could have been a few goals up before 1-0, although Armagh also created chances. “We made mistakes in a short period of time that allowed Armagh to attack and create some openings. “However, overall it was just important to get the job done and book that place in the quarter-finals. “Within the win it was great to see James Gray and Greg Moorhouse in good form together and linking well. “Renato found conditions difficult as he loves to run with the ball and the surface did not really allow him to do that as much as normal. “However, it will have given him another example of what kind of test you can face in the Irish League. “He is settling in well and learning with every match. “Another player who is learning the ropes week by week is young Caolan Marron. “For a young lad to come into the centre-back position and look so assured this season is really encouraging. It is a credit to the player but also to the people around the club who have been helping him make that step up into the first-team squad. Glenavon return to the battle for league points this weekend with a trip to The Oval against Glentoran. “Andy Kilmartin and Simon Kelly are both struggling with groin problems,” said Hamilton. “Andy’s is more serious and he has had to come off in recent games with the injury. “We did not want to really risk either player last week on the Holm Park playing surface due to the potential for long-term impact. “We go to face Glentoran with both clubs pushing hard for European football. Kick-off will be 3 o’clock in the Danske Bank Premiership.